Kristín Eiríksdóttir won the prize in January 2018 for her fiction, Elín, ýmislegt. She was interviewed by Sarah Duncan, an intern staying at the Icelandic Publishers Association at that time. 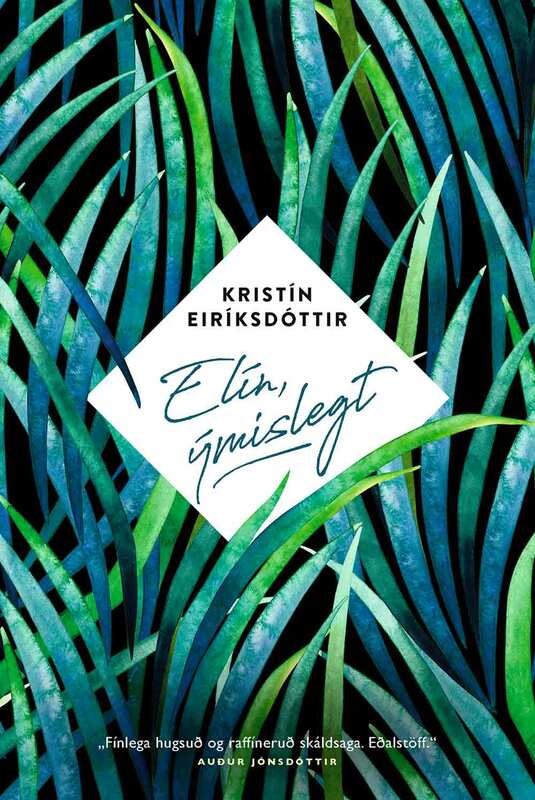 Paid mind-bender and seasonsed wordsmith Eiríksdóttir joined the exclusive club of Icelandic Literary Award laureates for Elín, ýmislegt, a hybrid distillation of varying artistic mediums. A linguistic amphibian, Eiríksdóttir sinuously maneuvres between poetry, prose and theatre. While this feature may germinate a fractured narrative scenery with jarring juxtapositions in the minds of many it in contrast exhibits a symphonic blend. In an interview with the writer I probed the predicaments she experienced in penning her award-winning novel (or lack thereof), the foreign literary terrain she is considering exploring as well as the rhythm of her thoughts. Congratulations on winning the Icelandic Literary Award. Speaking of which: why did you choose to deliver your acceptance speech in poetry? Writing a speech was a big challenge for me. It's a circumstance under which it is very hard to come up with sentences that haven't been said so many times that they have become meaningless. I had a couple of days to work on it. I was also just stressed out because I had to perform it on live television. I think that what happened was I went into the format where I feel most comfortable because I have been reading poetry to an audience since I was a teenager. So I think it was my way of actually staying in my comfort zone. Even though it might seem like stepping out a comfort zone to some people. What predicaments did you encounter in writing Elín, ýmislegt? I didn't meet any predicaments at all in the writing itself. It all happened very naturally. It's not always like that. Sometimes it's more difficult. This story kind of presented itself to me and I just wrote it down. It was harder for me to write my first novel partly because the structure of it is challenging. It's about a woman who keeps telling lies so I had to make sure that the reader believed her and then I would reveal her lies over and over. But also because it was my first novel and I was insecure. Can I write a novel? Is it something for me? Is this complete nonsense? Are certain emotions or events more easily or better represented in poetry compared with prose? Yes. Absolutely. What I've been trying to do is to find a way to use all of these things in one format. In Elín, ýmislegt for example I think it cracks into poetry at certain points. At one point it actually just turns into a poem by Ted Hughes because I felt that it was so descriptive of what the character was going through. There's also a performance artist called Sigtryggur Berg Sigmarsson who makes a performance called the Shivering Man where he starts to shiver and then he just shakes uncontrollably. It had a very big resonance with what another character was going through. So I wrote that performance into the book. The story happens in the theatre and there's also a play in the book written by a 19 year old girl. Can you tell us more about the visual arts in your novel? The main character, Elín , who is a 74 year old propsmaker for films and theatre, studied sculpture in Copenhagen as a young woman. She never thought of herself as a visual artist and loves what she does - to make props. But her way of viewing the world and of telling this story is very marked by her cognisance which, you could say, is that of a visual artist. Another big character in the book, Lilja, is a struggling visual artist. What selection process was behind the cover? The designer's name is Halla Sigga and she works at my publishing house Forlagið. She has done one cover for me before and I am always happy with what she does. It is said that 1 in 10 Icelanders is a published writer. Do you find the literary space predominantly competitive or collaborative? I think it is probably both and really depends on who you talk to. I actually don't think it is that different from other literary subcultures except maybe it's a bit smaller, incomprehensible and far away. Can you see yourself writing lyrics? Yes. Absolutely. I would love to. There's a composer called Þórunn Gréta Sigurðardóttir who made music out of my last poetrybook. Kristinn Sigmundsson the opera singer sang and it was a nice experience. So my poetry has been turned into lyrics but I've never written lyrics to music. I would love to try that. I think I will one day. Einstein said "I often think in music. I live my daydreams in music. I see my life in terms of music." What do you think in? I don't know. I think it depends on the day. I think that poetry is more related to music in a way. I definitely have sentences; maybe a better description of it than poetry or prose. I have my own way of thinking in words. It's hard for me to explain. But I don't think I would call it poetry or prose, they are just thoughts until I've worked them out in my document.